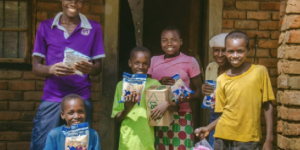 We recently shared an update from our partners in Malawi, Iris Africa. We have more good news to share from the work they are doing there. Every day, they are feeding orphans, widows and the blind, including Rose and her family. Both Rose and her husband Jafeti are blind and raising four beautiful children aged 3 to 12 years. They live in the rural village of Bzirkunda in the southern district of Malawi. It is difficult for the blind to access education, find employment, and be accepted by society. 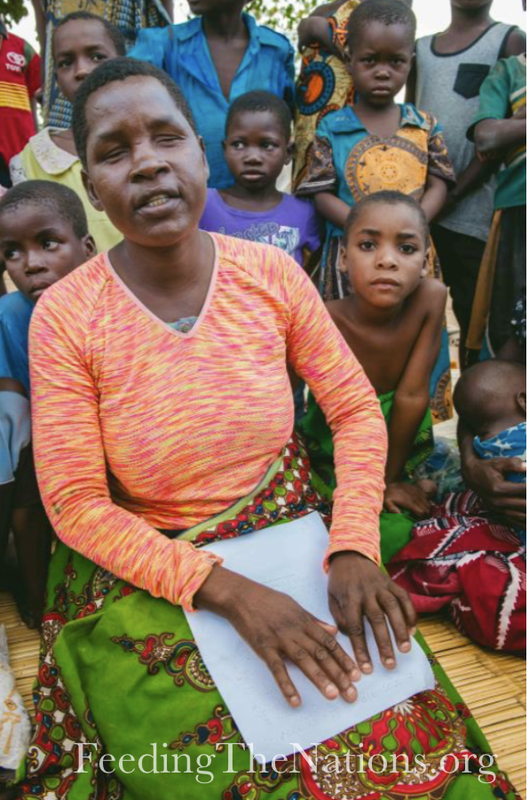 Rose and Jafeti are among approximately 136,000 blind people in Malawi, 80% of whom suffered from cataracts or glaucoma and would have sight today had they received adequate health care. Rose greeted us with a warm smile and welcomed each person individually according to Malawi culture. She tried her best to accommodate us by speaking English, putting into practice the education she once received. Rose had the opportunity as a child to attend a school for the blind and her success qualified her for secondary school. Unfortunately she was unable to complete due to a shortage of school fees. She fears that her own children won’t be well educated unless she is able to find money for school uniforms and resources. At the time of our visit her husband was away visiting his relatives in the neighboring district. Begging from village to village has become normal practice for Rose. She admits it is a hard life, but she has no alternative – she must find food for her children. She comments about the kindness she finds in people and gives thanks to God. Receiving MannaPack from the Iris Africa feeding program is a great relief. It means that Rose can stay home and focus her attention on nurturing her children and encouraging them to concentrate on their education. 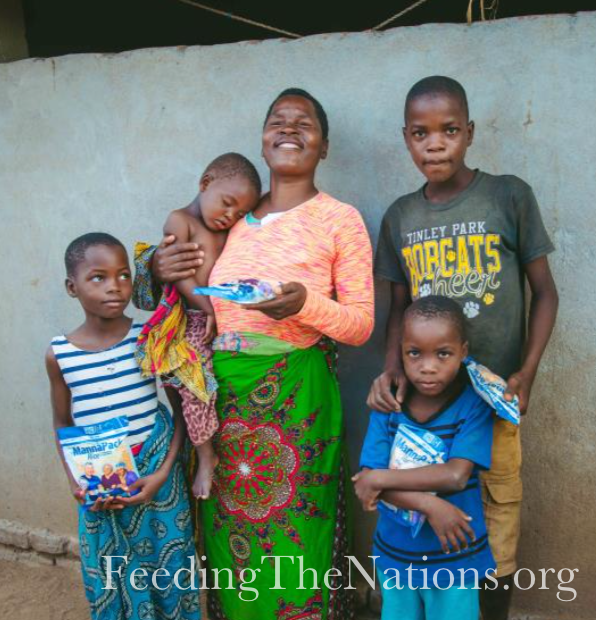 Rose shared how beneficial MannaPack meals are for her children. I questioned Rose as to how she measures its success. She said that by her touch she makes sure they are ok, and can feel the gained strength of each child. Rose had prepared a braille letter of thanks. We watched and listened as her fingers moved along the embossed paper delivering thoughtful words of appreciation. Here’s a quote from her letter. 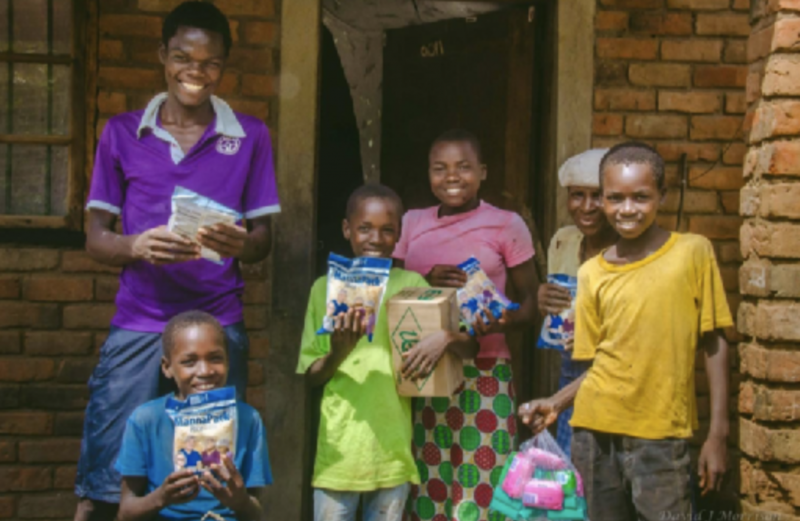 Long term solutions are needed to help the blind survive challenging conditions in one of the poorest countries in the world, but meanwhile, providing MannaPack brings tremendous relief. Rose shared her story in hopes that it will help donors understand the significance of their gift. Thank you to everyone who helps make missions like this one possible. Together we can feed more families like Rose’s. To do so, click the button below and donate today. 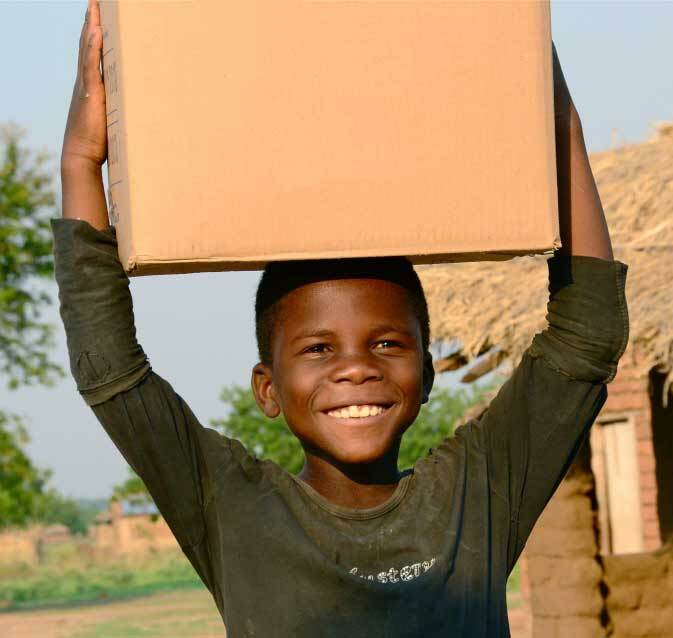 Each year, we feed thousands of children around the world by sending millions of rice/vegetable meals to schools and orphanages. Motivation for kids to attend school instead of being forced into child labor, human trafficking or food scavenging. Full bellies that allow the kids to better focus on learning. Nutrition for improved growth and overall health. 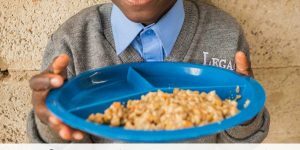 By taking part in the Beans & Rice Challenge, you can make a difference in the lives of hungry children around the world. And you don’t even need to leave your kitchen. For five days, we ask you to forgo your typical fare and instead eat beans and rice for one to three meals a day. Then we ask you to donate the money you save. Whether it’s $20 or more for the entire week, every little bit matters when it comes to the cause of feeding the hungry around the world. Simply commit to setting aside one to three meals a day from Monday, November 12 through Friday, November 16 to consume beans and rice instead of your typical meal. Figure out what you would typically spend on those meals. Then figure your rice and beans cost. Donate the difference at this link or choose whatever amount you see fit. 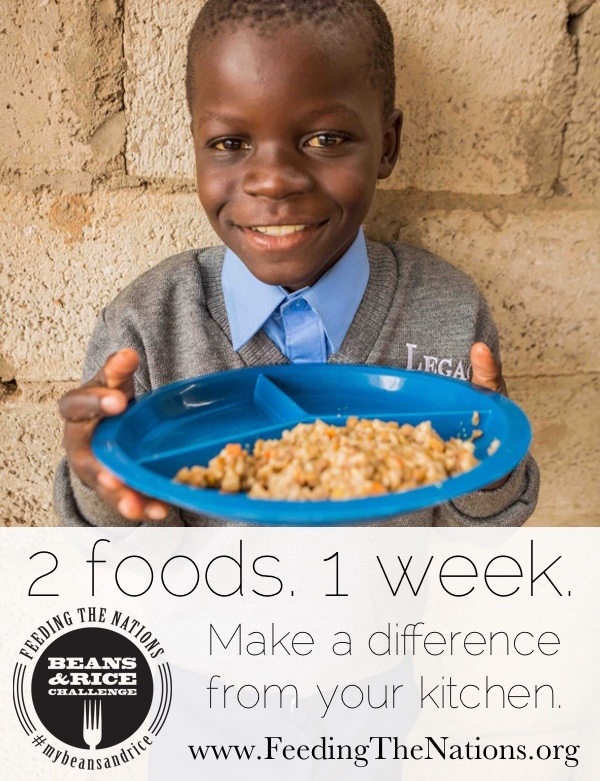 Remember, $1 can provide 20 meals, so every bit matters! Are only beans and rice allowed? Can we add anything else to the dish? In the interest of walking a mile in another person’s shoes, we prefer that you keep the dishes simple. But, there are no rules. We do have a collection of recipes on Pinterest. While we tried to choose simple fares, they do include some seasonings and spices. Can I eat beans and rice for more than just one meal? We appreciate your enthusiasm! Choose as many meals as you’d like to participate. Follow us on Pinterest to find recipes for your five-day challenge. Stay up-to-date with us on our Facebook, Instagram and Twitter pages. Sign-up for our email list to receive updates along the way. YES! Use #mybeansandrice on Instagram, Facebook and Twitter to join the conversation. Share recipes, photos of your meals, quotes, inspiration and more. Commit to joining with us today. Mark your calendar now. Post a link to this page on Facebook and challenge your friends and family take part. Make it a learning experience for your kids. Together we can make a difference. Together we can feed nations of hungry people. 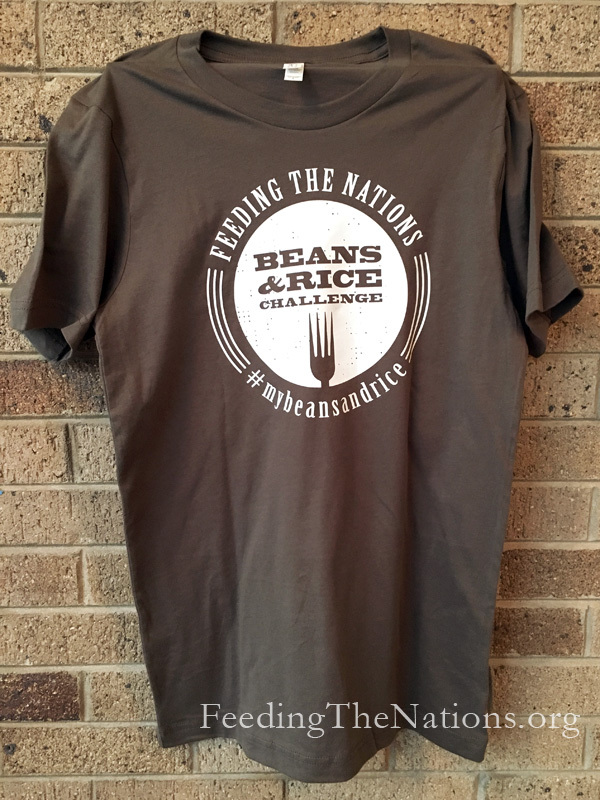 Show your support for the Beans & Rice Challenge by sporting the t-shirt! 👕 This shirt is available to anyone who donates $25 or more. 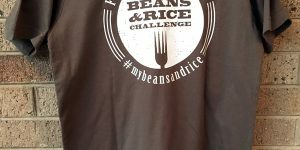 When you donate, choose “Beans & Rice Challenge” in the gift designation field and select your shirt size (adult S, M, L, XL or XXL; youth S, M or L). Please note: only one shirt per donation of $25 or more. 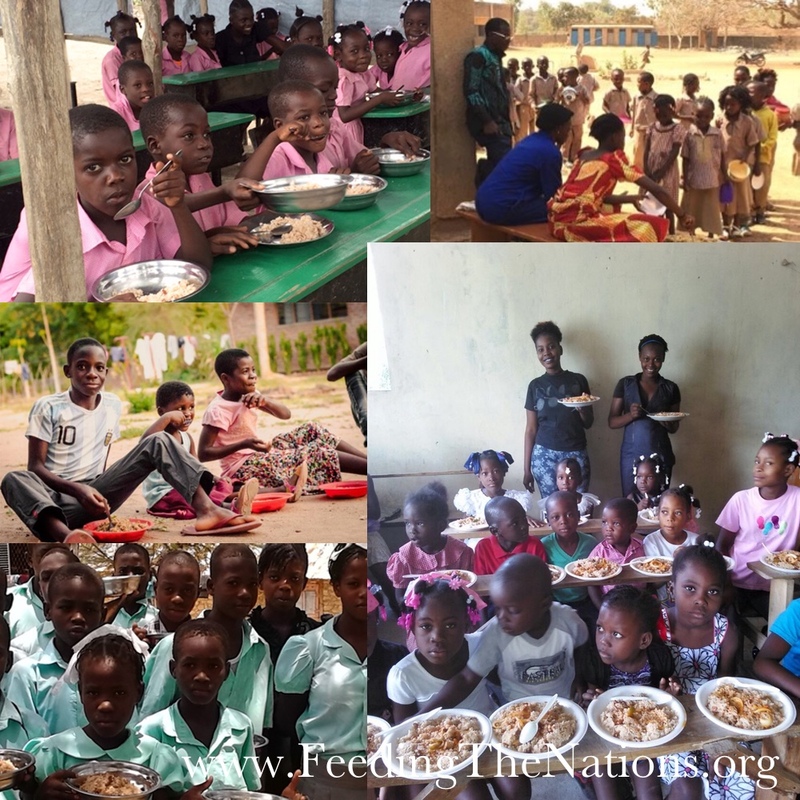 Wondering what impact your donation to Feeding The Nations makes? It helps people like Velia—an elderly grandmother in Malawi who cares for her 5 orphaned grandchildren. She is frail and no longer able to work as a farmer in the fields, but she is very capable of providing a safe shelter for her grandchildren. She is thankful that her grandchildren are able to attend the local primary school where they receive food each day. She is hopeful that the education they receive will make them strong for the future. Last year Velia became extremely ill and the family feared the worst. It is hard to imagine life without ‘agogo’ here. She is the one who holds the family together and no one was prepared for her to die. Thankfully, she recovered and continues on serving her family. She and the children really enjoy eating the rice/soy meals. 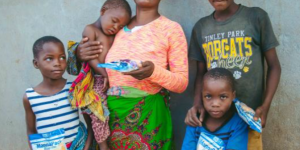 Agogo says, “The food is good food – it makes us strong” and strength is what is required for Velia and her five grandchildren. 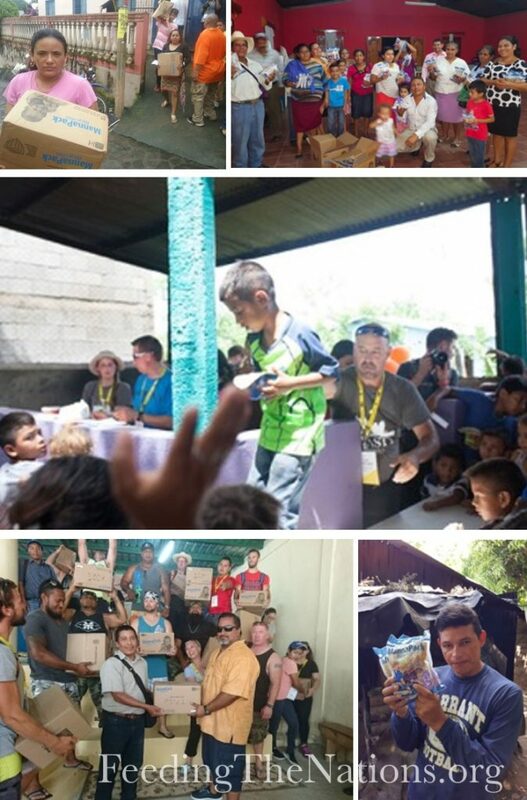 We had the honor of partnering with 1Nation1Day as they blessed the country of Nicaragua. During the event, hundreds of thousands of people gathered across Nicaragua in 12 different locations and millions of people watched through a live broadcast. The event brought the nation together for the same cause–to see a brighter, more vibrant Nicaragua. Missions like these are possible through partnerships. We can’t do it alone. We thank everyone who made this possible and we ask you to partner with us. Will you donate today, so we can feed more hungry people?